The Daleks have been Doctor Who's most unstoppable villains for pretty much the show's entire run — but what drives them? What are they a metaphor for? On one level, they're clearly a version of the Nazis, created by people who lived through World War II. But their creator had another metaphor in mind. The one recurring dream I have – once or twice a year it comes to me – is that I'm driving a car very quickly and the windscreen is a bit murky. The sun comes onto it and it becomes totally opaque. I'm still hurtling forwards at incredible speed and there's nothing I can see or do and I can't stop the car. That's my recurring nightmare and it's very simply solved by psychologists who say you're heading for your future. You don't know what your future is. However much you plead with somebody to save you from this situation, everybody you turn to turns out to be one of 'Them'. And there's nobody left – You are the lone guy. 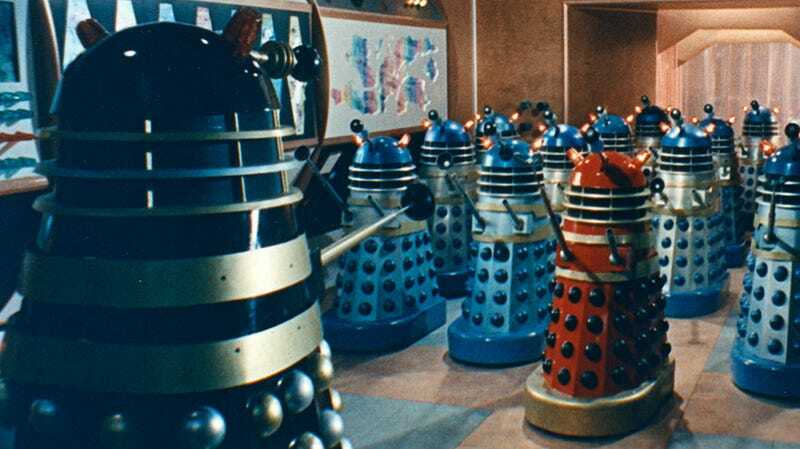 The Daleks are all of 'Them' and they represent for so many people so many different things, but they all see them as government, as officialdom, as that unhearing, unthinking, blanked-out face of authority that will destroy you because it wants to destroy you. I believe in that now – I've directed them more that way over the years. Read the whole Terry Nation interview, in which he also talks about Blake's 7 and why he thought Doctor Who would never succeed, here and here.